Rodgers is devoted to horses. She grew up riding them and earned her degree in equine business management. For the past eight years she’s served as program director of MTR, a nonprofit organization that seeks to improve the quality of life of those with physical, developmental, and emotional health challenges through human and horse interaction. MTR offers a range of programs, depending on what an individual needs. 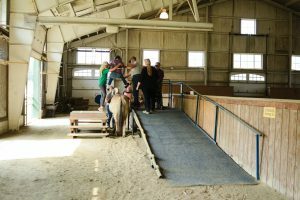 They include Therapeutic Riding, where instructors teach riding skills, Hippotherapy, in which the rider participates in one-on-one therapy sessions under the guidance of an occupational, physical, or speech therapist, and Equine-Facilitated Psychotherapy, where a mental health professional and equine specialist work as a team to provide a therapy setting to someone working through emotional distress such as depression, anxiety, or trauma. Equine Therapy is a fascinating concept, though hardly new. Hippocrates wrote of the horse’s power to heal those with incurable illnesses in ancient Greece. Beginning in the 1940s, Equine Therapy grew in popularity across Scandinavia and other parts of Europe, eventually making its way across the Atlantic in the 1970s. Nowadays, there are more than 7,600 facilities around the globe helping nearly 62,000 children and adults. And they help in profound ways. 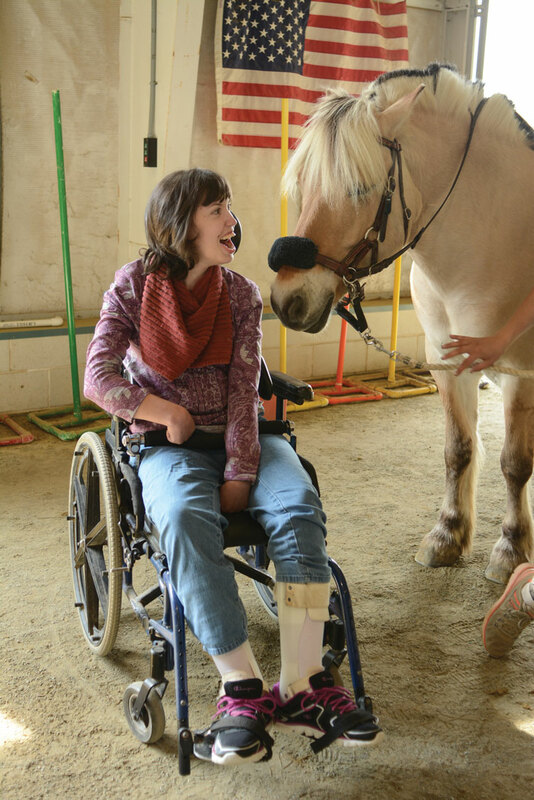 At MTR, the stories abound—of children who were previously unable to speak saying their first words, of adults in wheelchairs sitting up and trotting, unassisted, on a horse, of military riders suffering from post-traumatic stress disorder finding solace and calm simply by grooming a horse. From improving balance, coordination, muscle tone, and flexibility to ameliorating sensory awareness, interpersonal communication, mood disorders, self-esteem, and more, the benefits to riding and simply being around horses are enormous. 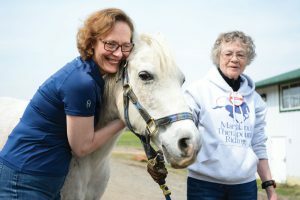 “We’re very goal-focused here,” says Cathy Rosenbaum, who serves as MTR’s executive director. “It’s not that these miracles just happen. There’s a thought-out plan to build upon to make sure that it can happen. And that’s on the part of the instructors, therapists, and the families working together to determine what the goals should be and how to get there. 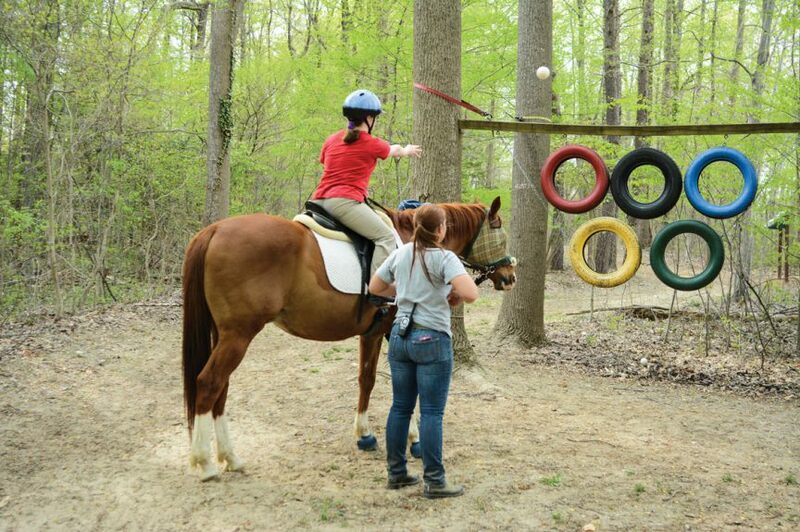 Sometimes it’s riding, sometimes it’s working on their ability to process movement and space and catch a ball while they’re sitting on a horse.” And sometimes it’s the sensory trail ride through the nearby woods, which features activity stations that enhance the rider’s visual, spatial, tactile, and auditory senses—colorful tires dangling from trees, a wooden box full of jars of rosemary, cinnamon, and other fragrant herbs, a bridge that the horse hoofs clatter across at the end of the trail. And she’s not the only one who thinks so. Six years ago, Richard Mosher joined the impressive group of 200 MTR volunteers—a range of professionals, including emergency room nurses, attorneys, and teachers, who come to the farm weekly; many say that the experience is just as therapeutic for them as it is for the riders. With hardly any horse experience, Mosher started out by shoveling horse poop five mornings a week. Now he is a volunteer mentor, the board’s treasurer, and is learning to ride. He is impressed with the powerful connection that happens between horse and human. “I can sense the emotion, I see the emotion, but I can’t translate it.” MTR’s mental health professional Trisha Itzel says that such transformations occur in just a few weeks, compared to a typical clinical setting, where the same results may not happen for four months. Error: Error validating access token: Session has expired on Saturday, 09-Mar-19 15:57:50 PST. The current time is Friday, 19-Apr-19 11:56:19 PDT.